With so many types and styles of pillar candle holders available, you can find nearly endless ways of using them to decorate. In addition, you can turn ordinary household objects into custom pillar candle holders or use craft supplies you may already have on hand to embellish your candle holders. Look for candle holders that will fit nicely with the décor and style of the room in which you'll be using them. Pay attention to details such as texture, color and form. Glass candle holders can be used in practically any type of setting and will fit in with any type of décor, from modern to rustic. The shape and design of a glass candle holder helps define the style, from the simple, sleek curves of a cylinder shaped holder to the intricate angles of a formal looking cut glass holder. Candles may rest on top or be placed inside the holder, where the flame can be protected from airflow while illuminating the glass. Hurricane shades are a common type of glass candle holder and are distinguishable by their elegant, oil-lantern-type curves. Colored glass will add jewel toned, sparkling hues to the room's décor. Pottery Barn- Find a great selection of hurricane glass shades, rustic hanging mason jars and antique mercury glass pillar candle holders. World Market- Here you will find seagrass wrapped glass candleholders, recycled glass, ribbed glass and Spanish blown glass. Bed Bath and Beyond- Find simple round and square glass pillar candle plates, elegant glass column style holders and hurricane shades shaped like wine glasses. Ceramic and porcelain candle holders make colorful, artistic accents, similar to pottery. 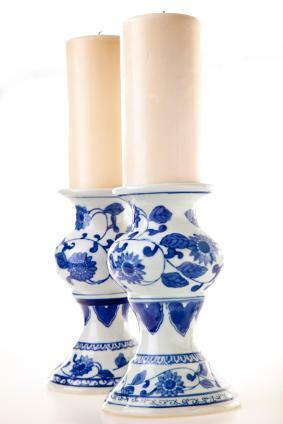 Use ceramic candle holders to brighten a room, shelf, table or bookcase. This type of candle holder looks attractive even when empty. Glass hurricane shades can be used with a ceramic base. Artful home- Shop for unique, handmade ceramic candle holders shaped like animals and lanterns. Be prepared for higher prices here. Decor Universe- Here you can find a small collection of ceramic candle holders at mid-range prices. The unique designs are worth taking a look at. Uttermost- View this company's exclusive ceramic candle holders. You will need to locate a local retailer for prices and ordering information because Uttermost does not sell directly to consumers. Wood candle holders come in a variety of heights, including very tall holders that make a striking display. Turned wood holders look much like the balusters on a stair rail and you can choose from rich, dark finishes to light, natural finishes. Wood holders are typically sold in sets of two, three or five. You can also find them in other shapes like arches, rings and cubes. The nice thing about real wood candleholders is that you can sand them down and refinish them if desired. Give wood candle holders an antique look by distressing them. Overstock- This site has a wide selection of wood candleholders at very competitive prices, as they carry closeout stock. This also means inventory will change often, so once an item sells out, it may not become available again. Arcadian Home- Find a great selection of upscale wood candle holders but be prepared for higher prices. 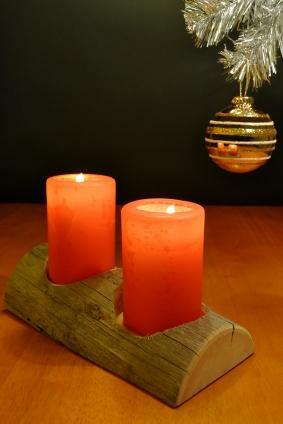 Wayfair- Here you will find a nice variety of wood candle holder styles with mid-range prices and free shipping. 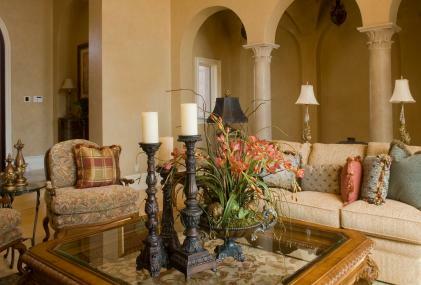 Elegant scrolls and a rustic finish make wrought iron candle holders a good choice for traditional style décor. Silver and brass candle holders can be used to dress up a dining room table. Pillar candle wall sconces made from copper and other metals make nice accent lighting and give the room a vintage feel. 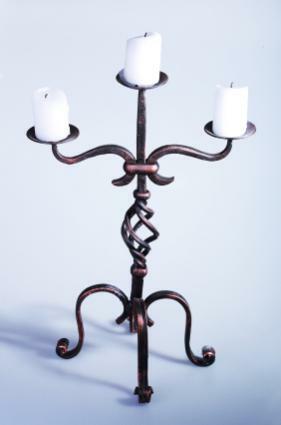 Tall, floor candle holders made out of pewter, brass or iron add a stately, Gothic look. Bellacore- This store has a nice selection of metal candle holders in both traditional and modern styles. Lower-priced holders range between $30 and $50 and go up from there. Free shipping is offered on orders over $75. Home Decorators Collection- The selection at this store is limited, but you can find attractive metal candle holders for under $30. Pier 1 imports- Here you will find a large selection of metal candle holders in every style and at really great prices, with some as low as $10. You can make your own pillar candle holders by repurposing other household items. Look for old mason jars or other glass jars you may have around the house. Add simple embellishments such as a decorative ribbon, suede cord with beads or raffia. Fill a shallow glass, wood or ceramic container with sand. Add a few pillar candles and seashells. Wrap small rubber bands around a cocktail glass in various directions. Spray an even coat of frosted glass spray paint over entire surface. Allow paint to dry then remove rubber bands. Turn glass upside down and add a colored LED light under the cup. 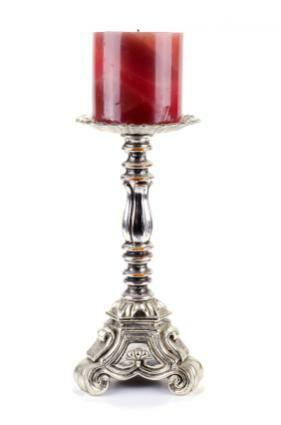 Place pillar candle on inverted base. Shop for vintage teacups and saucers at thrift stores and yard sales. Place a pillar candle inside the teacup and display on a table, dresser, bookcase or shelf. In a wooded area, look for a birch, pine or aspen tree branch or log that is at least 5-6 inches thick. Plane one side of each piece to stand flat. Place the tree branch in a vice or clamp. Use a 1 ½ inch wood boring bit to drill a two inch deep hole into the center of the branch. 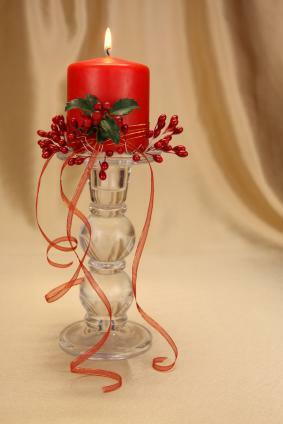 Insert a glass or metal casing to hold the candle (glass jars, votive holders or metal molds work well). Cut a small log in half lengthwise. Use a 1 ½ inch wood boring bit to drill two 2 inch deep holes into the rounded side of the log. Insert a glass or metal casing into each hole. A well decorated room doesn't happen by accident. When the basic principles of design are used with accessories like candles, a balanced and harmonious room comes together. Pillar candle holders are perfect for adding vertical lines to a room, especially when using very tall, oversized candle holders. The holders can also provide wonderful form to the room's design, with sleek curves, sharp, defined edges and interesting, irregular shapes. Pillar candle holders look best when grouped together. Uneven numbers tend to make the most aesthetically pleasing groups. Three candles holders in varying heights make a very attractive display, especially when using large candle holders. Groups including five to seven candle holders can be used to create impressive centerpieces and displays on wall shelves or furniture such as dressers and buffets. Display candle holder groups on mantels, bookcases and on the fireplace hearth. Don't leave candles burning in nooks you won't pass often. It's best to keep candles burning for only a few hours at a time, so melted wax doesn't build up. This will also keep the candle from burning through one of its sides.